The Pulling Linemen: Roundtable - Evaluating the best, and worst, Offensive Lines in the NFL today. Roundtable - Evaluating the best, and worst, Offensive Lines in the NFL today. Toby Durant: Welcome to what will be the first of many roundtable discussions about the NFL. With me I have fellow co-founders of The Pulling Linemen; Phil Gaskin and Gur Samuel. Firstly I feel I should tell you where our allegiances lie before we begin. I’ve been a long standing fan of the New England Patriots and Phil is a keen fan of the St. Louis Rams. Gur, the newest to the game out of us, follows the Tampa Bay Buccaneers. TD: I’d say the Saints are up there. Evans and Nicks are monsters in the middle. PG: Agreed, the Saints guards really make that O-line. Stinchcomb is a good RT, and Bushrod will become a good LT, but it’s really in the middle that the Saints dominate. GS: One of my arguments for the saints having the best o-line, beyond their beasts at guard is that Brees is really short. I really believe he needs more time to see the play developing than QBs with a better field of vision. 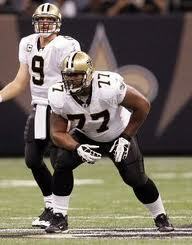 The fact that their passing attack is as good as it is speaks well of the O-line’s able to give Brees that much time. TD: True, he can't see the underneath so well. And he needs clear lanes, which he gets. PG: I’m not gunna buy the "Brees is short" argument. Brees is clutch, which makes the Line's job easier. TD: They both make each other look good. PG: Exactly. The line is great, and so is Brees. You can't use the deficiencies of one as an argument for greatness of the other. It's the same as the terrible Peyton Manning argument. Everyone always says he's amazing because he plays with terrible other players, and makes them good. Not true, he plays with decent players, some amazing (Jeff Saturday, Reggie Wayne, Dwight Freeney etc) and they help each other look good. GS: Yeah, Manning definitely has a lot of elite players around him. Yes, last year they won that division with a lot of their stars injured. But then again Manning’s play was pretty horrible during that stretch despite winning games. TD: Let’s not get off topic already! The Saints line. The tackles are a weak spot, but how much so? Considering Tampa and Atlanta have upgraded their outside pass rush do we see this being a big problem? GS: Not that much I'd say. They are weaker but I wouldn't say weakness per se. PG: The left side is going to improve year on year, whereas the right will start to decline. It’s not something the Saints should worry about any time soon. They will need to start looking for a new RT soon, but good at least this season. TD: ok, next up, Atlanta. They have a solid line year after year in both run blocking and pass protection, but have just lost Harvey Dahl. GS: Yeah, Dahl is a big loss in the run game, which is a huge part of their offense. Also, centre Todd McClure is getting up there in years. GS: I definitely respect them, they are a good unit. But like I said, Dahl is a big loss, especially with McClure being old. You gotta wonder how long he can keep it up, and if he can’t, there's gunna be a pretty big weakness in the middle. TD: If they can't find and in-house replacement for Dahl, given what they've traded for Julio Jones, they could be in trouble quickly. GS: Especially if they abuse Turner as much as they did last year. He had a LOT of carries last year; without a good line to protect him, he will go down like he did in 09. PG: This is true. And the deal they put together for Julio was foolish. The picks they've lost are exactly where you would be looking for new O-linemen for the future, now they've really gambled on the present. Also, it's worth thinking about Matt Ryan. He's rated as an elite young QB, but has he ever really been truly exposed? TD: Ryan is going to need a pocket. He's not got the movement of a Rodgers or Cutler. PG: Precisely. If he's seeing pressure, how quickly does his accuracy drop? TD: They're going to need to make an investment in free agency next summer you feel. And that's always risky. GS: Next up for me are the Titans. PG: Well for the Titans all you have to look at is Chris Johnson's numbers. GS: They have a good reputation, but again, I do wonder how much is down to Chris Johnson & Vince Young's elusiveness. They are good, but again, I think they are given a boost by that. TD: Johnson got yards up going straight up the middle too and they were able to keep the statue of Kerry Collins upright when he was playing. PG: They took a big drop at centre when they couldn't convince Kevin Mawae to continue playing though. Eugene Amano isn't the guy. But the combo of Roos, Scott and Stewart are crushing. GS: Joint 6th least sacks given up last year. It’s definitely a solid O-Line. TD: Ok, anything else to add? PG: Not really, Jake Scott has an awesome beard. Now then Toby, Pats...? TD: Excellent. 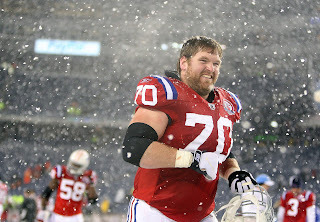 Let’s go from Left to right then: Bringing Matt Light back is a good move, you don't want to throw a rookie, even on as good as Solder should be, straight in after an abbreviated pre-season. Logan Mankins, not much to say that hasn't been said already, huge presence on the line as the enforcer, can get down field on screens and can also grow a great beard. Centre Dan Koppen is getting on but still getting it done. Dan Connolly looks like the full time starter at RG now Stephen Neal has retired. He was solid filling in last year during Mankins’ hold-out and should be capable at RG. TD: Quite. Vollmer at RT, I like the kid. I was expecting us to slot him into LT before the draft but I’m more than happy with him at RT. Plus we have a 5th rounder in Marcus Cannon who had 1st round potential bar the Lymphoma. He was still benching 315lbs after his chemo sessions. GS: Cannon and Solder definitely give you nice depth. PG: Ah yeah, Cannon is a specimen. Great pick for a team that doesn't need him to start for 2 years. GS: Well, next year when Mankins leaves. TD: Where do you guys see weaknesses? PG: Realistically, it has to be Koppen if he's on the downward slope. If Vollmer's progress continues like it did last year then you couldn't call him weak. TD: Koppen is a worry; he's been there a long time now and rarely missed a game. But we certainly don't have a proven back up for him if he goes down. PG: Backups are a luxury though. GS: They're a luxury until you need them. TD: They are, but when they're a cheap 5th rounder and you've got a disgruntled franchise tagged guard they're handy! GS: Ok, moving on to your biggest threats… The Jets. They've got arguably the best centre in the league. TD: Yea Mangold is great I’ll give them that. And Ferguson has finally started to show that top 5 talent when he was drafted. TD: However Damian Woody's retired, and he was a mauler on that right side. GS: Yeah, he will be missed. PG: Yeah, looking very thin on that side. Unless Vlad Ducasse is going to move outside? TD: He couldn't be worse than he was at G.
TD: I think that’s all of the best O-Line’s covered. Let’s move on to the surprise packages of 2011. PG: As long as I can mention St Louis here I'm happy. TD: Ok, What about your Rams then Phil? PG: I am excited about our line. We have bookend tackles, provided Jason Smith can keep his head in order (concussions, not temperament). Saffold was a star in camp last year, instantly earning LT when he was brought in to play RT. Brown and Bell are old hands inside, who haven't yet lived up to their billing, but there has been a hole at RG for ever which made their job difficult. PG: I tweeted before the lockout ended that signing Dahl would make me ecstatic, and it has. He's the aggressive force we need to support Jackson in the run game, and has a tonne of experience. The key to getting our deep passing game going this year will be better running, and hence play action - Dahl will make that happen. TD: I think they are everyone's pick for that division. But where could it go wrong on the line? PG: If anyone gets injured, there's trouble. GS: you've got Goldberg for depth though? TD: Might want to rectify that. Bradford's your future. PG: He is indeed, and I fully expect us to pick up some experienced free agent linemen as they're cut throughout training camps. GS: I'll tell you who has an underrated line. The Panthers. Kalil is one of the best young centres in the game. TD: I'm not sure I'd say underrated. It was only a few years ago they went 12-4 and had the best ground game in the league. 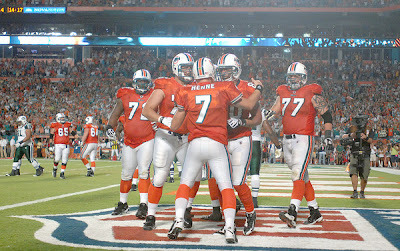 While making Delhomme look competent. It's just QB play that's ruined them recently, Gross was a pro-bowler last season. I do like that line. GS: But when you go 2-14, people do have a tendency to assume that they're a bad team, when in fact, they have a lot of strong pieces, and the line is definitely one of the stronger units. PG: It's a great line to be honest, definitely only a few pieces away from .500 again. TD: They suffered some injures there last season, Otah was out for a while I seem to recall. And they were definitely one of the better 1st pick teams of recent seasons. GS: Yeah, Otah was out for a lot of the season. They’ll improve with him back. PG: Do we have to? Trueblood is a penalty machine. The end. GS: Trueblood lost his starting spot halfway through the season, thankfully. I think they could be the weakest line in the division. Donald Penn's got LT locked down and Joseph is a beast in the run game but he didn't have the best 2010 season. He needs to pick up his play a bit in the pass game too. Jeff Faine is massively injury prone and our RT could definitely use an upgrade, which is why we pursued Doug Free so heavily. Ted Larsen had a pretty good rookie season; he's got potential but needs to pick up his play. TD: Are they a cause for concern then? GS: I'd say so. 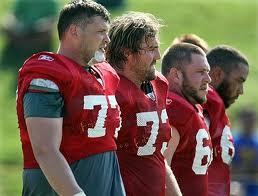 The biggest problem is we've got a new O-line coach this season and are switching from zone to man schemes. And he doesn’t have a lot of off-season to install it. ...but that is a pretty damning argument, switch scheme in a 2 week off-season. TD: I think Freeman made them look pretty good last year. GS: Yeah. Luckily, freeman is extremely hard to take down, very mobile, and Blount is a beast - it made our line look a lot better than it was, cos they themselves escaped a lot of sacks and tackles in the backfield. Most of our line was drafted for a power scheme (we only switched to zone in 09), so they're better suited for it... but it really depends how quickly the new coach can work the line. TD: One team I think have the potential to dominate the line of scrimmage for the next decade is Seattle. They’ve invested heavily along the offensive line and can currently boast 2 1st round and 2 2nd round picks since ’09 that are expected to start come week one. And added former 1st round selection Robert Gallery. GS: Toby, I think the Seahawks run game is gunna take a lot of people by surprise, if the line can gel quickly. They’ve done nice things for the future, but LT Russell Okung struggled with injuries last year. PG: It's true. The Seahawks are set (and I'm very jealous of them taking Moffitt this year), but if you've got no-one to protect then what's the point? TD: Absolutely. The problem comes if the QB's can't keep an 8th man out of the box. GS: I think they're gunna be one of the most hurt by the lockout... their pass game may as well be non-existent, and their line is young. Lynch can’t go beast mode 20 snaps a game haha. PG: If Tavaris is the starter, you'd assume the hope is that he can keep the play alive with his feet long enough for Sidney Rice to get free. GS: And if Mike Williams didn’t get fat again. PG: And the point with Lynch is that, fine, he went into beast mode once. Jerome Harrison ran for 286 yards against the Chiefs once, but no-one cares about him. 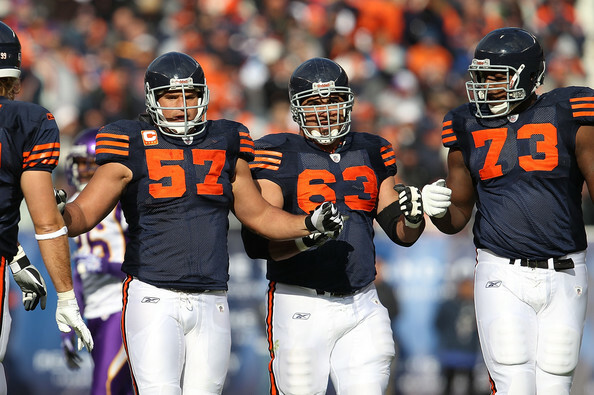 TD: One dark horse I have for improvement is the Bears. Yes they started off last season with an ABYSMAL line but they chopped and changed until eventually finding a good line-up and begun to get their act together. PG: I think the bears can be a decent unit this year, for sure but only if J'Marcus Webb really starts to get it this season. TD: Are you not sold on the idea of Chicago having a decent line in 2011 then Gur? GS: They're losing a massive piece in centre Olin Kreutz. And it's not just the play, he was a massive leader in that locker room. TD: They are, it's very hard to replace a centre who has been there that long. But they’ve bought Spencer in and he’s very is capable. And I really like the pick of Gabe Carimi in the 1st round this year. GS: There was a great stat on NFL network the other day - cutler was actually sacked more under Martz's system than previously. I think they'll improve, but not be better than average. I think you need veteran leadership with this short an offseason, so I really don’t like them letting Kreutz go. 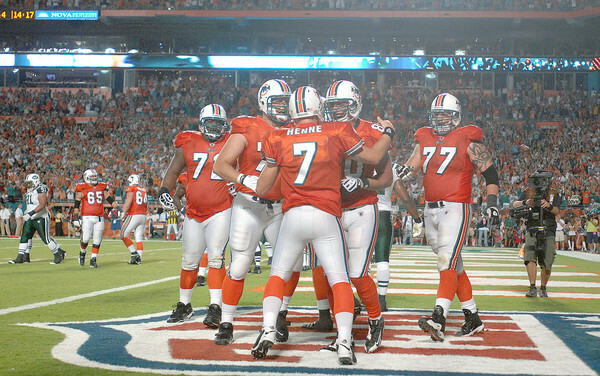 And, I think even if they do play better, cutler will hold onto the ball longer, Olsen was such a safety net for him. TD: He did enjoy getting scared and randomly throwing it towards Olsen. PG: I think the biggest help for cutler would be if Matt Forte can find some form again. Which again ties in to the line open some lanes for him. GS: Yup. I think, on average, their offense will be a little better this year, but not by much. GS: Yeah, the Lions D-Line could gobble them up. TD: Haha. Ok, any other nominations for a surprise package? TD: Hmm. Can't fault their LT that's for sure. GS: It depends on how quickly Pouncey can pick it up. Apparently he was struggling with his snap count at camp. TD: That's a problem for a potential centre. GS: I watched one or two Florida games last season, and he was horrible at shotgun snaps. Admittedly it was in the beginning of the season, so don’t know if he improved over the course of the year... But I really think he'd be better off at guard. Chad Henne was having to do the O-line protection shifts for him at training, but I imagine that's probably common for rookie C centres. TD: I think they start him at guard too. PG: Yeah, but this is still week 1, and remember that he doesn't have to play centre - Richie Incognito has played really well for them since signing, and he and Pouncey can interchange at C/G depending on what suits. GS: Well, from the sounds of it he's taking reps with the 1st team, but as you say, that'll probably change if he doesn’t pick it up. TD: Personally beyond Long I don't feel they have much to shout about at OL. But rumours are they’re trying to sign Shaun O’Hara. PG: They signed marc Colombo, and John Jerry at guard could well develop into a top notch player. GS: For this year, if they go with Pouncey & Jerry at guard, Incognito at centre, and Long and Colombo at tackles they could surprise people. PG: They could, hence my suggestion. GS: yep, I'm buying into what you're selling Phil. TD: All right, who's next? GS: Eagles. I really like them picking up Evan Mathis. TD: They had issues last season keeping a normal QB in Kolb on his feet, but with Vick it's a different beast. I liked the pick of Danny Watkins a lot; I think he's going to be great. GS: Yea, picked up Watkins in the draft, Evan Mathis in free agency, and I've seen suggestions on Twitter that it would let them kick Herremans out to tackle. PG: Yeah, they've got some nice pieces there, and Herremans is definitely an option at RT. 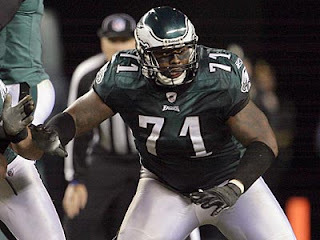 TD: I’m not so sure that Jason Peters is a top notch LT anymore. He seems to me to be slowing down. GS: Peters is less of an issue with Vick being left handed. TD: True but with Ware coming through there twice a season you don't want him getting close to Vick even once. TD: And it's almost certain that Kafka or Young will have to start a game. PG: At least 1. It could be 15. You never know with Vick. GS: Haha, that’s true. Young was a really smart pick up though. Even if he does step in, he's got all the tools to run that offence. GS: I want this point in here: the Redskins are definitely worst O-line in the league as it stands right now. TD: Worst line, there's a good thought. Any other suggestions? I think the Bills come close to that title. PG: Yea, it’s just the Backus factor keeps them in the running. Raiders? 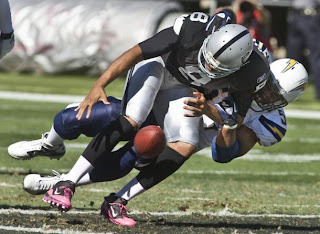 TD: Oh my… the Raiders really are in trouble actually. Especially with Cable and Gallery gone. GS: Yup. They tried for Gaither but failed. 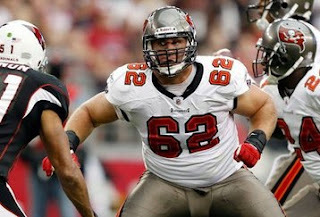 Amusing O-line titbit: the Bengals wanted to sign Litui, but he failed the physical coz he was too fat. PG: Ahhh, yeah. Has Gradkowski gone? TD: Yeah, to the Bungles bless him. PG: So it's Campbell's show finally? Poor guy. TD: I think that's as good a note as any to leave it on. Cheers gents. No one mentioned how good the Texans line is and Colts were only mentioned in passing. Also, Mawae did want to continue playing but the Titans only wanted him back as a backup. 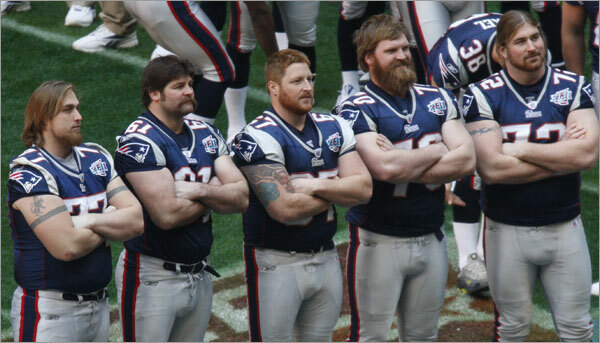 Patriots were without a doubt the best line last year, even without Mankins! But retaining him and Light is key to them if they hope to be the best in 2011. Gur Samuel wins understatement of the century for "He [Davin Joseph] needs to pick up his play a bit in the pass game too". Hmmmm... Perhaps the Texans was a slight oversight here. Even though their line isn't full of "big name" O-linemen (if there is such a thing), they're very solid in pass pro, and Arian Foster's numbers last year show just how good they can be in the run game too. The Colts didn't really fit in to the best, worst or surprising lines for me. Last season they lacked any real dominance in either run or pass, and gave up more sacks than they have done since 2007 - perhaps playing a small part in Peyton Manning's run of poor form. In theory, their line should be much improved in 2011 having added Castonzo and Ijalana in the draft, but the Colts being good again wouldn't really constitute a surprise! Good read there boys. Although being more interested in skill positions makes me have to really concentrate to stay interested in all this big boy speak! As far as the Eagles go, from what I hear Winston Justice will be starting RT if his knee gets better fast. If not then expect Watkins to play RG, Mathis to play LG and Herremans to slide over to RT. I personally think this should happen anyway. Another note. Jason Peters is looking very good in camp so far. If he can keep his mandatory false start per game in check then he is looking like an elite LT.
Good job boys, keep up the good work.